The regular airport shuttle bus service is provided by Platanus travel agency in Dubrovnik. This service is run by comfortable air-conditioned buses and it is a cheap way of getting from Dubrovnik airport to your apartment or hotel. The journey time is 30-40 minutes depending on traffic. If you would like more comfort and immediate transfer upon your landing you will need to book your private car transfer from the airport to the city of Dubrovnik or any other destination in the region (Kotor, Herceg Novi, Cavtat, Plat, Mlini, Zaton, Orasac, Ston, Korcula, Hvar, Split). Check private car transfer deals here. Upon planes arrival buses meet all scheduled flights at Dubrovnik airport for transfer to the city of Dubrovnik. Buses are located just outside the airport building. The shuttle bus departs from airport and runs directly to Dubrovnik. First stop is Pile Gate (western entrance to the Old Town). You should get off the bus here if you stay in the Old Town, Pile or Ploce. If you stay at one of many hotels and apartments in Lapad or Babin Kuk you should also get off the bus here and change to city bus which will take you to your accommodation (buses no.4, no.5 or no.6). The airport shuttle bus runs further to main bus station which is located in port area of Gruz. Journey time from Dubrovnik airport to the city is approximately 30 minutes. Tickets for the shuttle bus can be purchased at Platanus travel agency counter at the airport, from the ticket machine (in front of the bus) or from the bus driver. One-way ride to Dubrovnik costs 45 HRK (€6) while return journey costs 70 HRK (€10). Another option of travelling from the airport to the city is to take organized shared transfer (air-conditioned and comfortable mini van) which will take you directly to you accommodation. This transfer costs €14 and should be booked ahead your journey online. 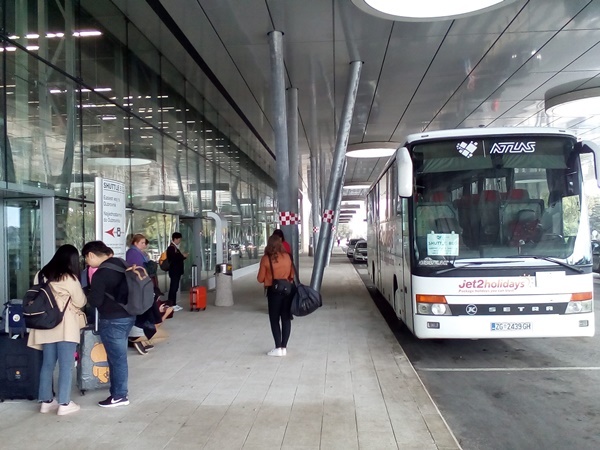 Shuttle bus generally leaves from main bus station in Gruz 120 minutes before every international flight and 90 minutes before every domestic flight. Bus also take passengers at bus stop next to Cable car embarkation station. This stop is convenient for those whose accommodation is in the Old Town or neighbourhood of Ploce. For any additional info about shuttle buses please call following contact: +385 (0) 99 275 1145 & 99 340 7160. Travel agency Korkyra introduces a new shuttle service from Dubrovnik airport to destinations on Peljesac and Korcula island. This service will be available from 30th April until 1st October. Shuttle buses/vans will connect Dubrovnik airport with Orasac, Slano, Prapratno, Trpanj, Orebic, Korcula, Lumbarda, Brna and Vela Luka. From Monday to Friday there will be four departures in both directions, on Saturdays five departures and on Sundays seven departures. For detailed schedules and prices check Korkyra travel agency web site. Tickets should be booked in advance.